Our LED dancefloors are the perfect set up for weddings, parties, and events. Perfect for transforming a dull dance floor into a disco dancing haven, or even creating a magical dance floor in any space. The dance floor led illuminated, will be sure to impress guests. We offer our dance floors in three options. Choose the standard LED Dance Floor for the traditional one colour dance floor. Alternatively, opt for our exclusive patent pending interchange LED dance floor, which allows you to change the colour of your floor through tile fascias. Our newest dance floor LED Colour Master, allows you to change the colour of your LED lights using your mobile phone. Our standard LED Dance floor range is available in one fixed colour of your choice. Our Interchange LED Dance Floor comes in one colour, but can easily be adapted into other colours through the exclusive interchange feature. Colour tile overlays are available to purchase additionally. Our electrical component circuit clips are fitted with a spring to help maintain connection. No wires should be coming loose with movement on the dance floor. Acrylic Foamboard – Not Wood! Our extensive testing showed that dance floors made from a wooden base are prone to bend, and even break in certain temperatures. We have therefore made ours from an alternative, and tested, foamboard and acrylic material. This means not only are the floors even more sturdy, they are also lightweight too! If in the unfortunate circumstance that a bulb blows, don’t worry, you won’t need to replace your entire floor, or tile in fact. Each bulb can be changed individually, quickly, easily, and cost efficiently. It won’t cost you any more than £2 to replace! 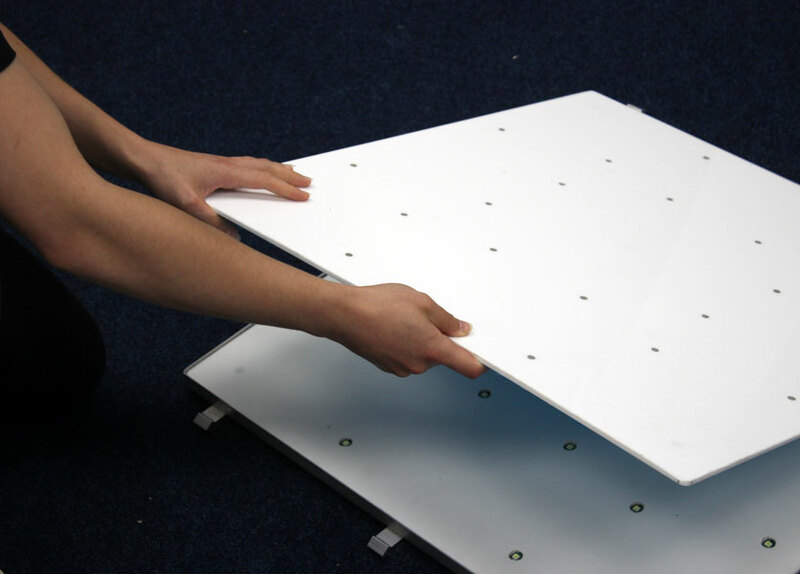 Our Interchange LED Dancefloors offer flexibility with design so that you can change the tile fascias, as well as strength in build featuring spring loaded circuit clips as well as being manufactured in lightweight acrylic foamboard. If you want to be able to offer both black and white LED dance floors but don’t want to buy two… our patent pending dance floors are perfect! In order to decide the colour of the floor all you need to do is apply a tile fascia. You can even apply the fascias in patterns! Because the tile fascias come off individually, it makes cleaning exceptionally easy. There are no electrics in the tile fascias, meaning cleaning with water is no problem, you can even wash them under the sink if you need too! Give them a good scrub with some soapy water, they’ll be sure to keep sparkling for longer! The main advantage to our dance floors is that in order to change the colour of the LED dance floor, your just overlay a tile fascia. This means you can add different colour dance floors to your portfolio for only a fraction of the cost, as you are only replacing the fascia and not the floor itself. It also means you can create different effects using the tile fascias, such as a chess effect. 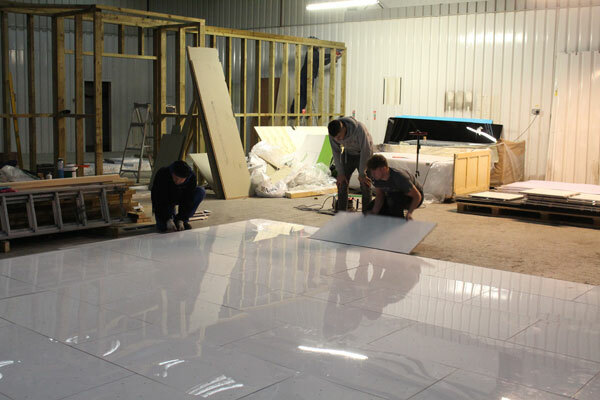 Our LED Dance Floors are manufactured and assembled in the UK, here at our premises in Halesowen, West Midlands. LED Dancefloors are perfect to have at weddings. They give that added sparkle to the bride and groom, and encourage guests to get on the floor and have a dance. The LED lit dance floors entice everyone to step on board. 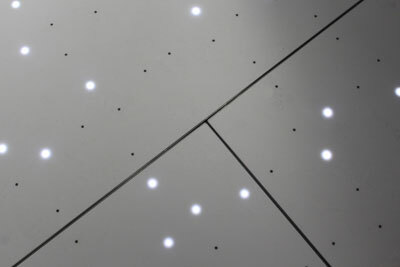 The LED dance floors can lay on top of any flat surface inside a building or covering. If the surface is uneven, we recommend you lay a sub floor underneath the the dance floor as a protective layer. Are the dance floors adjustable? You can choose whether to have a square or rectangle shape when assembling your dance floor. The dance floor is provided in separate panels which fix together to fit the venue space in the best way. The length of time it will take to assemble the dance floor will depend on what size dance floor you purchase. On average it will usually take 20 – 40 mins. How quickly can I receive my dance floor? 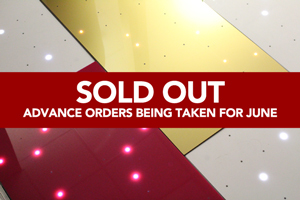 All of our dance floors are made to order, you can expect them to be ready to collect in 7 weeks time.